The goal of this study was to investigate if and to what extent age, independent of comorbid diseases, is a risk factor for negative in-hospital outcome with mTBI. In a retrospective cohort study, we identified 1589 adult patients treated for isolated mTBI in our level-1 trauma center between 2008 and 2015. We used logistic regression analyses to assess the odds of any adverse event by age group (< 65, 65–75, 76–85, and 85+), adjusting for gender and chronic diseases. The prevalence of any adverse event during in-hospital care among mTBI patients was 3.2% overall, 1.8% among those younger than age 65 years, 2.1% among those age 65–75 years, 8% among those age 75–85 years, and 19% among those age 85+ years. The odds of any adverse event were similar in patients aged 65–75 years, but increased among senior patients 4.4-fold for age 75–85 years (OR 4.4, 95%CI 2.0–9.8, p < 0.001), and 18-fold for age 85+ years (OR 18.0, 95%CI 8.7–37, p < 0.001). Additionally, chronic alcohol abuse (OR 7.0, 95%CI 3.2–15, p < 0.001), diseases of the musculoskeletal system (OR 4.3, 95%CI 1.5–13, p = 0.008), and diabetes mellitus (OR 2.7, 95%CI 1.2–6.5, p = 0.023) increased the odds of any adverse events independent of age and all other covariates. The odds of sustaining an adverse event increased exponentially after age 75 independent of gender and any comorbid diseases. Our data support international efforts to manage senior patients in interdisciplinary geriatric trauma units. There are no conflicts of interest with this topic. Epstein DS, Mitra B, Cameron PA, Fitzgerald M, Rosenfeld JV. 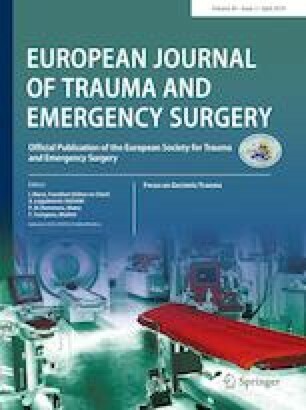 Acute traumatic coagulopathy in the setting of isolated traumatic brain injury: definition, incidence and outcomes. Br J Neurosurg. 2014:1–5. https://doi.org/10.3109/02688697.2014.950632.